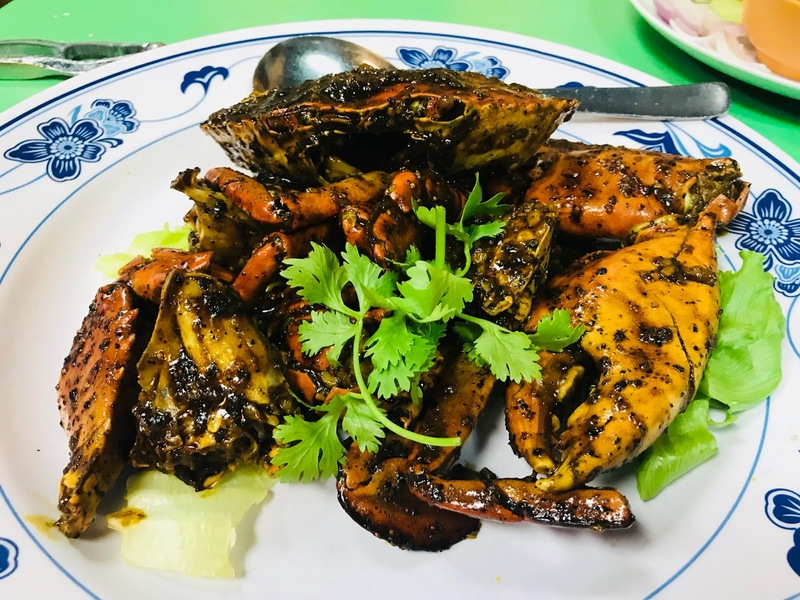 New Ubin Seafood was first established in 1986 on the north shore of Pulau Ubin, serving up quality kampong-style seafood. New Ubin Seafood moved to mainland Singapore when the Singapore government acquired Pulau Ubin in 1992. News of their quality seafood spread like wildfire and the restaurant was awarded Michelin Guide Singapore Bib Gourmand in 2016 and 2017. 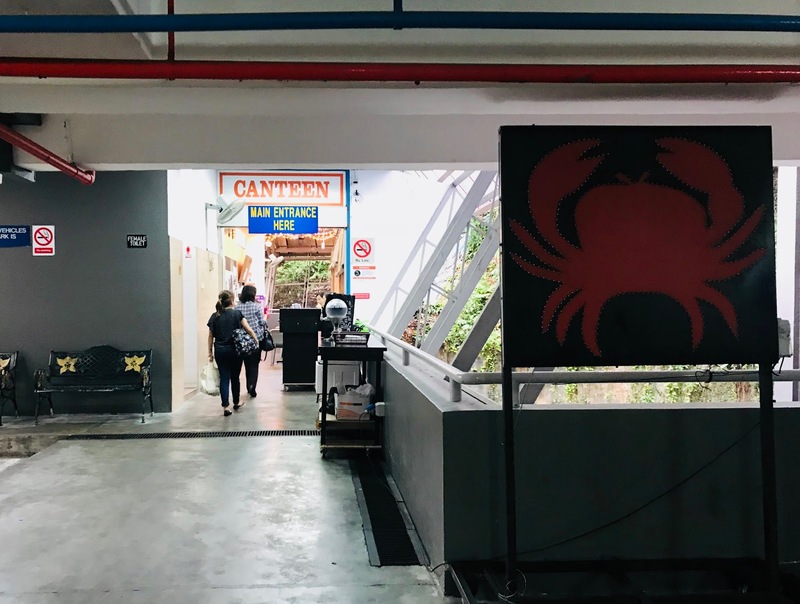 New Ubin Seafood’s newest location is in Lam Soon Industial Building in Hillview with the main entrance facing the multi-storey carpark. I was surprised at the location because Hillview is a pretty secluded region in the west of Singapore that is only accessible by the Hillview MRT station of the Downtown Line, a few buses and cars. 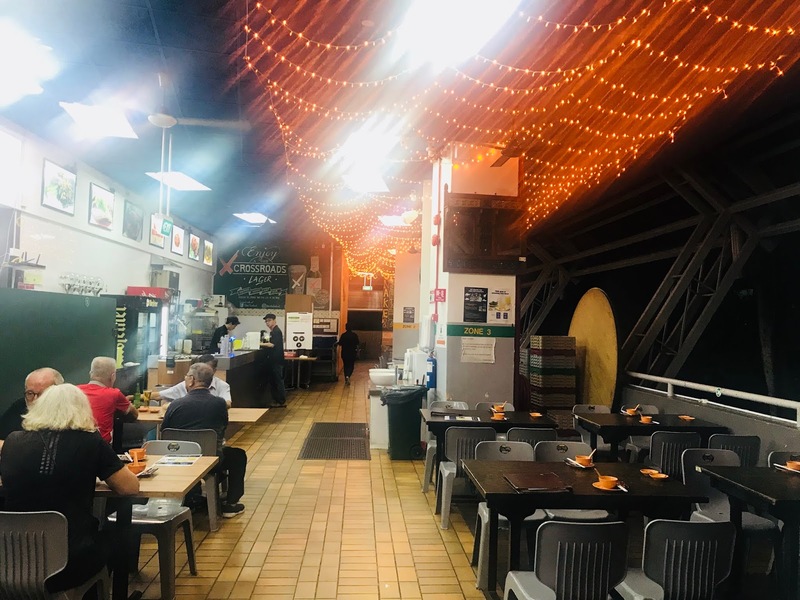 Perhaps the inaccessibility of the area is exactly what New Ubin Seafood is after, to recreate the kampong feel of the original restaurant on Pulau Ubin. Believe it or not, a trip to this restaurant at this far-flung location does give one a sense of going back in time to the olden days. New Ubin Seafood offers both air-conditioned and alfresco seating. 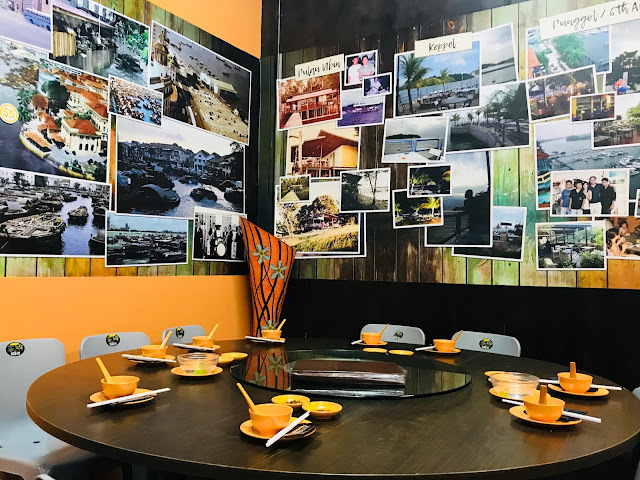 The wall at the back of the air-conditioned room depicts photographs of their previous locations at Commonwealth, Keppel Marina, Punggol Marina and Sixth Avenue (Bukit Timah). New Ubin Seafood has expanded to a 2-restaurant operation with the other outlet at CHIJMES.CHIJMES’s full menu can be found here. 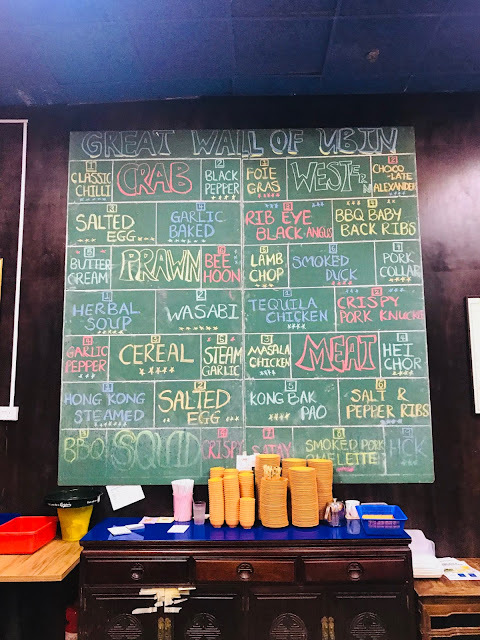 Those are visiting New Ubin Seafood for the first time and have no idea what to order can refer to their “Great Wall of Ubin” board, which shows their most popular and recommended dishes. You can view the whole Hillview menu here. Below are a few of New Ubin Seafood’s best dishes, tried and tested by my two colleagues who frequents the restaurant. New Ubin Seafood offers three sizes of crabs: 500g at $42 per crab, 800g at $58 per crab and XXL (weights approximately 1-2.5kg) at $9 per 100g. The staff recommends the 800g crab which is more than enough for sharing yet affordable. My colleague has been going on about how utterly delicious their Black Pepper Crab [$58] is that it was one of the first dish we ordered. The black pepper gives off a strong pungent fragrance, coating and penetrating the entire crab. 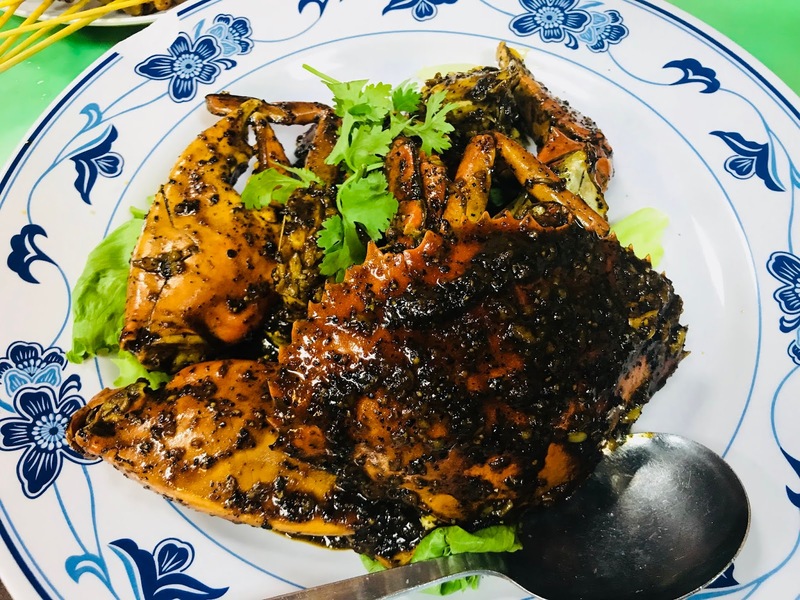 The 800g crab cooked in the superb black pepper sauce is full of meat and very fresh, making this dish all the more delicious. We were debating whether to get the signature Garlic Baked Crab or the Salted Egg Crab and we ended up choosing the Salted Egg Crab [$58] because another colleague who has tried the Garlic Baked Crab commented that there is nothing special about it. 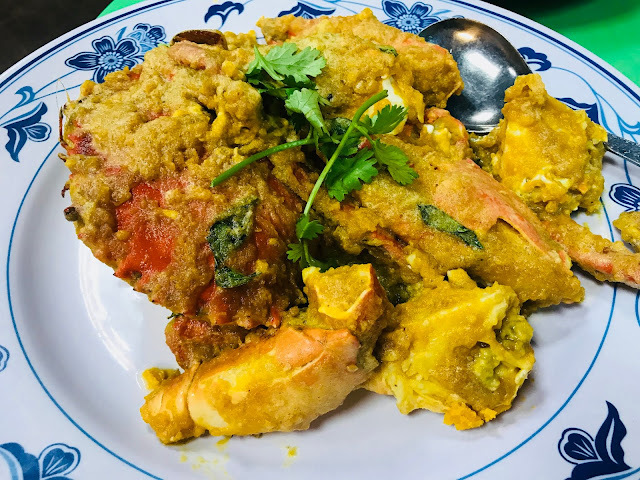 The golden grainy salted egg sauce generously coats the entire crab, the sauce is so fragrant that I found myself scooping up the remaining sauce on the plate. However, the finger-licking salted egg sauce is nothing without the fleshy 800g crab that is packed with succulent crab meat. Besides serving scrumptious seafood and traditional cze char fare, New Ubin Seafood has its own interpretation of other cuisines. 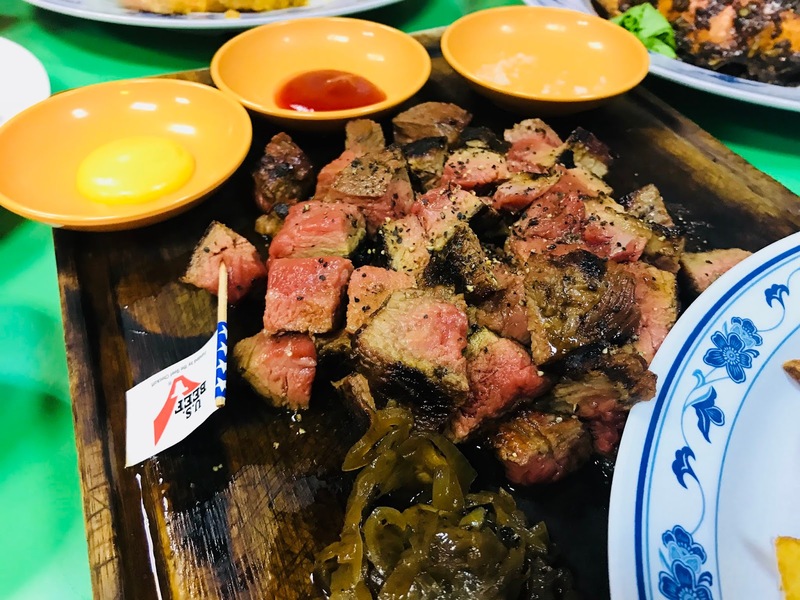 US Black Angus Ribeye Steak (approximately 500-700g per cut) [$14/100g] uses USDA-certified black angus beef, charcoal-grilled till medium rare, and served in bite-sized pieces. Potato wedges, caramelised onions and condiments such as mustard, ketchup and sea salt are served together with the beef. The leftover fats are minced and wok-fried with rice and dark soy sauce into sinfully-delicious fried rice. 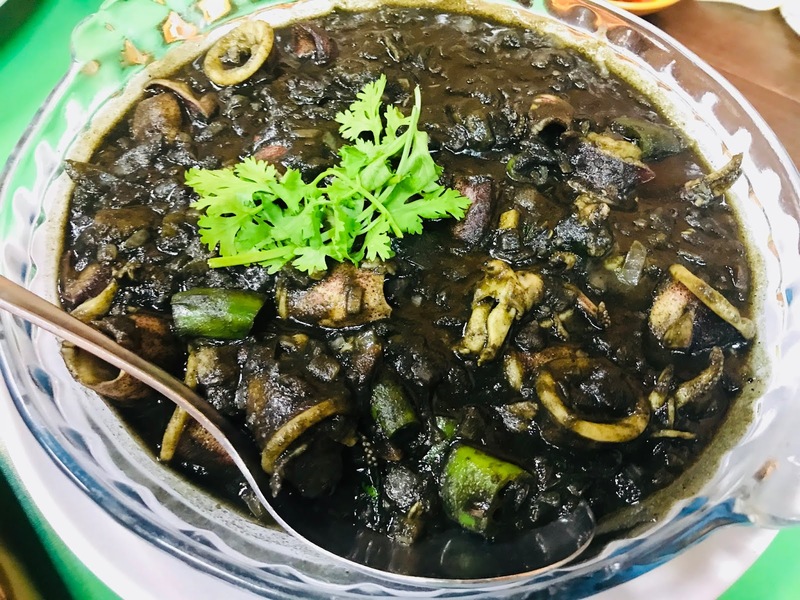 Black Ink Squid Curry [$16/$24] is a fusion dish marrying Indian spices with western style of cooking squid. The squid rings are delightfully tender with a slight crunch and the spices gives the dish a robust flavour. You have three choices of meat when you order Traditional Satay [$0.85/stick]: pork, chicken and lamb. Lamb satay are not very common in Singapore, so we got 10 sticks of chicken and lamb satay each. The lamb has been marinated well to mask the gamey smell and the chicken is sweet and tender. 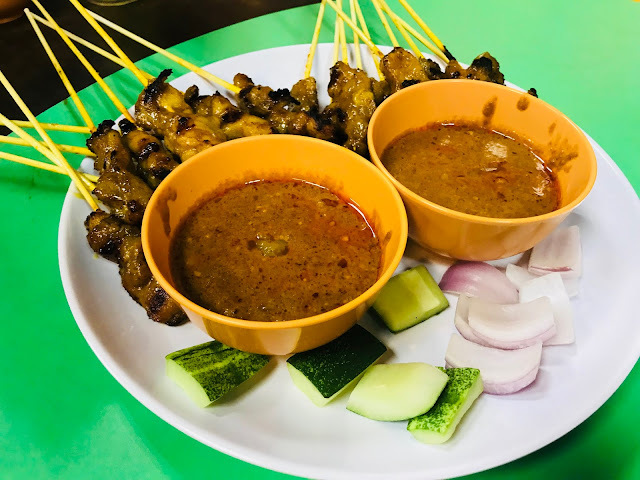 The satays are grilled till slightly charred, giving the satays a delicious smokiness. 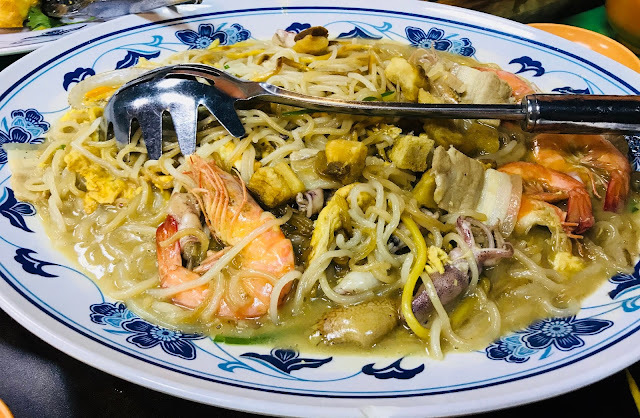 Fried Hokkien Mee Special [$14/$26] is the premium version of the humble dish that can be found all over Singapore. I like that the seafood broth is thick and rich, the noodles are not overcooked and are of the right texture. The use of whole baby quid and tiger prawns is not something you will see elsewhere. The best part? They use real lard in cooking this dish which makes all the difference. 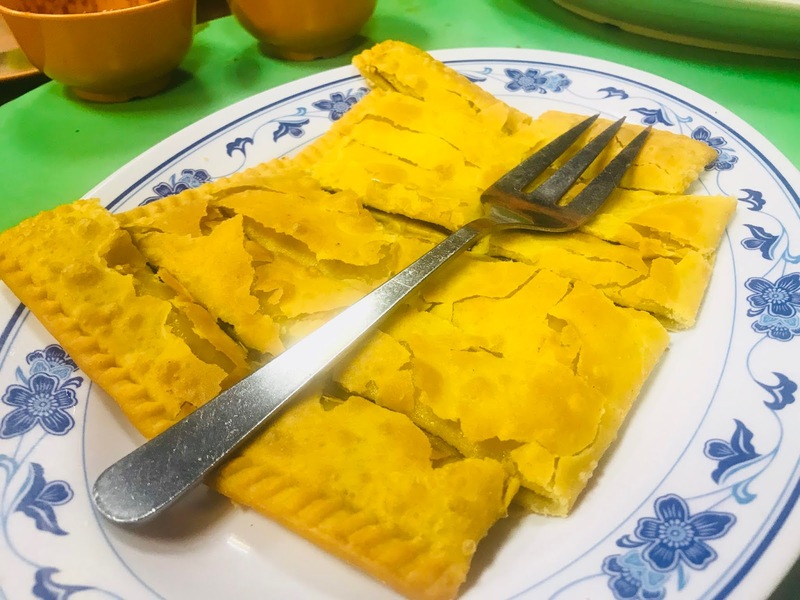 I do wish that more shrimp paste can be used to make the Har Cheong Kai (Shrimp Paste Chicken) [$15/$20/$24] but the crispy outer layer and the moist tender chicken inside is unfaultable. I find that the Crispy Red Bean Pancake [$10] is a little floury and it could do with more red bean filling. This timeless traditional dessert is perfect for those who want something simple and sweet to finish their meal. 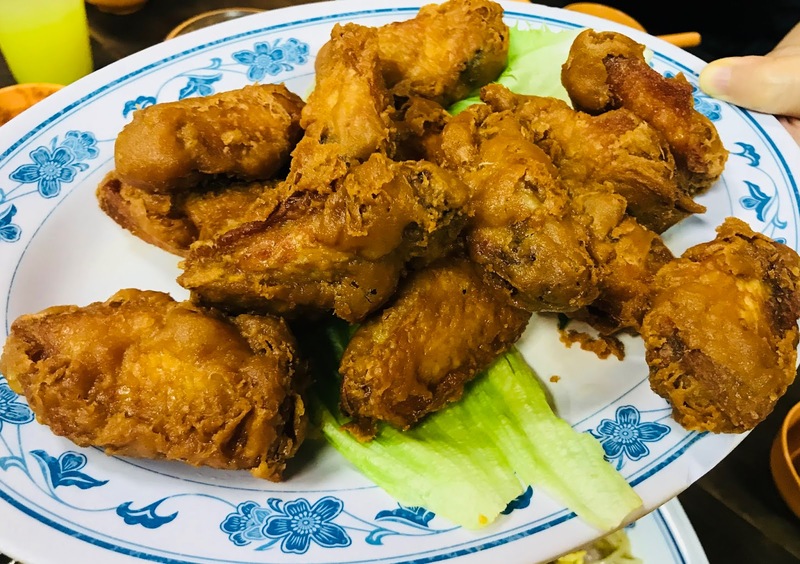 New Ubin Seafood definitely lives up to its name as a Michelin Guide Singapore Bib Gourmand awardee with fresh quality seafood and fusion dishes, warm hospitality and a clean restaurant with a laid-back kampong feel. The inaccessiblity of the restaurant has not made the restaurant any less popular. The restaurant is always fully-booked and reservation at least 1-2 weeks in advance is highly recommended! What is your favorite dish at New Ubin Seafood? Tell me in the comments!